These tips for how dads can help with breastfeeding are from a man’s perspective! If a breastfeeding dad feels left out, these tips tell you how to involve Dad in breastfeeding for an even closer family bond. 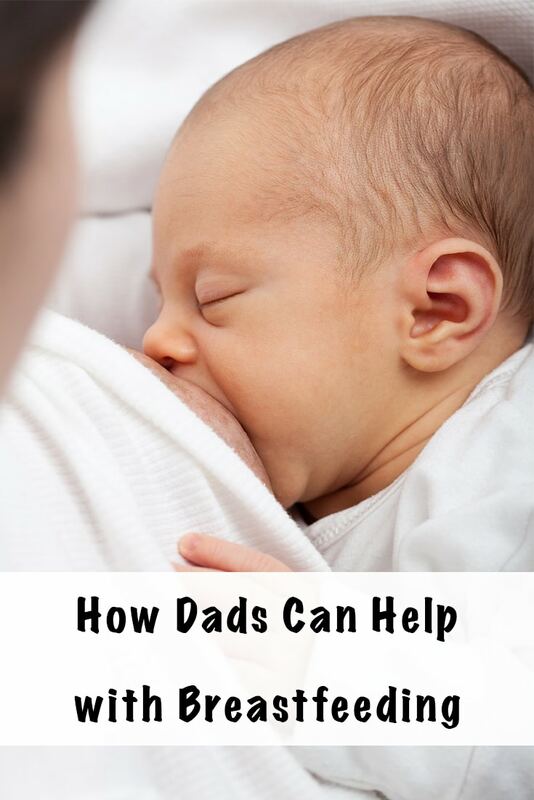 In this post, my husband is sharing his top tips for how Dad can help breastfeeding Mom. Becoming a dad is a life changing event, but your wife or partner’s life has changed even more. Getting through the newborn state together requires commitment and your full support, especially if your partner wants to breastfeed. Did you know that the a supportive partner is one of the biggest factors in whether or not a new mom is able to breastfeed successfully? By learning how dads can help with breastfeeding, you can support your partner, bond with your baby, and save significant money. Although breastfeeding is natural, it takes determination and hard work during the early weeks. Also, cultural stigmas in our society can make your partner doubt herself. She needs your support to be successful at breastfeeding. The dad’s verbal support and active involvement with a breastfeeding baby are enormously beneficial for mothers and help them nurse past the initial newborn period. You have two jobs as a new dad. First, you need to protect your family from external threats and criticism. Second, you need to provide a stable, non-hormonal foundation for your family and look out for your partner’s physical and emotional wellbeing. Paying attention to your partner can help her feel personally loved and important, not just like she’s a breast waiting to be sucked on. Breastfeeding is making a comeback in the United States, but many older family members may not be well informed about breastfeeding. The baby’s grandparents may be concerned that their beloved grandchild isn’t getting enough to eat. This happened with us. Many Hispanics in the US prefer “las dos.” In other words, they breastfeed, but also supplement with formula. My mom texted or called almost every day for weeks asking if we were still “just” breastfeeding. She started bugging me about when we were starting our baby on solids, even though she was still way too young. She still hasn’t let up. This kind of constant questioning can make a breastfeeding mom question herself. Although there certainly are times when Baby isn’t receiving enough from breastmilk alone, if your baby is gaining weight well and your pediatrician isn’t concerned, then everything is fine. It is your job to protect your partner from badgering that can undermine her confidence. I stopped telling my wife when my mom texted to worry about her exclusive breastfeeding. If someone is talking directly to your partner, kindly but assertively tell them that you need to change the topic of discussion because breastfeeding is non-negotiable for you. Being informed can help you maintain confidence. You’ll probably hear lots of things about breast-feeding from family, friends, coworkers, and random people on the street. People will tell you things like that breastfeeding moms can’t eat garlic or that if she doesn’t pump, she won’t make enough milk. Learning about common breastfeeding myths and why they aren’t true can help you and your partner stay confident! If at all possible, take some time off from work after your partner gives birth. Parental leave a simple concept, but something our nation struggles with. Some of my previous colleagues boasted about not taking paternal leave and dedication to work. I don’t see how this is anything to brag about. I see myself as a husband first, father second, and employee third. There are certain times in our lives when we need to be somewhere other than work. I recommend taking a day for the birth and at least five days after that before returning to work. Ideally you should take more but we are battling the age old mindset. I was a very fortunate to have 10 days of paternal leave from the Navy, but I know many companies still do not offer paternal leave. Those first couple of days are an incredible experience and I hope you get the chance to experience it fully. If you can’t take time off work, try to arrange for friends or family to be with your partner for the first few days. Many women get the “baby blues” to some extent after giving birth. It’s your job to watch your partner carefully to make sure she doesn’t fall into full-blown postpartum depression. An estimated 10-15% of women develop postpartum depression. It can be severe and have significant consequences for both mother and child, and it can affect anyone. Some risk factors may make ppd more likely, including inadequate social support and/or poor marital relations. By supporting your partner and taking steps to support her breastfeeding, you can both improve her chances of breastfeeding successfully and help decrease her risk for ppd. Now that you’re home and have taken countless selfies with your new baby, it’s time to find a job. I’m not referring to an actual job where you get paid. What I mean are the jobs available at home, more commonly known as chores. Mom will always have the ultimate job as ‘milk lady’ but you can become the ‘dad of all trades’ by picking some or all of the following tasks whenever possible: change diapers, bath time, feeding the animals, dishes, laundry, paying bills, preparing meals, etc. There is no shortage of chores to be done. With your better half fully employed you will need to take charge of most of the household chores. Remember that you are trying to continuously nurture your family’s spirit. Taking responsibility shows your partner you are serious about your family, baby, and values. Breastfeeding is hard work, especially during the first few days of having a newborn. As mom figures out the ideal position and equipment for feeding, you can help ease some of the back pain with back massages and backrubs. Before getting a My Brest Friend pillow, my wife’s back was in agony. You may also experience some back pain from carrying your new baby around. My rhomboid was killing me! Invest in reusable hot packs like these. They literally saved my back. This is your time to shine…or stumble around. It’s a good idea here to get a dimmable night light, preferably in red to preserve your night vision and not wake you up fully. We prefer salt lamps which already have a bit of a red color to them. When your newborn wakes up in the middle of the night, they’re probably hungry and they may need a clean diaper. As a dad with a breastfeeding baby, you can only help with one of these problems. Since Mom already has work to do, your task is simple: change the diaper and present a newly diapered baby to Mom in the right position. The night feeds can also be a dangerous because an exhausted mom might fall asleep. Falling asleep on the sofa with an adult increases SIDS risk and can lead to suffocation. Be the watchful eye in the night and offer to stay awake with your partner. She may want some snacks or water and you will already be awake and happy to bring it to her. This is also a good time to do some reading. Invest in a backlit kindle and read some Stephen King. It will help you stay awake. Now that you are fully employed, it is time to fine tune your trade. There is a right and wrong way to hand your partner her baby for nursing. She will really appreciate having the baby handed to her already oriented the correct way for feeding instead of having to reposition your wobbly-headed newborn. Talk with your partner and find out how she prefers to feed. After some practice you will be able to communicate with non-verbal cues on breastfeeding positioning. You may elect to use a blanket for the baby’s head support. Use this clue to help you determine the baby’s head location. Your partner may also simply expose a breast and you will automatically know what the best way is to present your offspring. 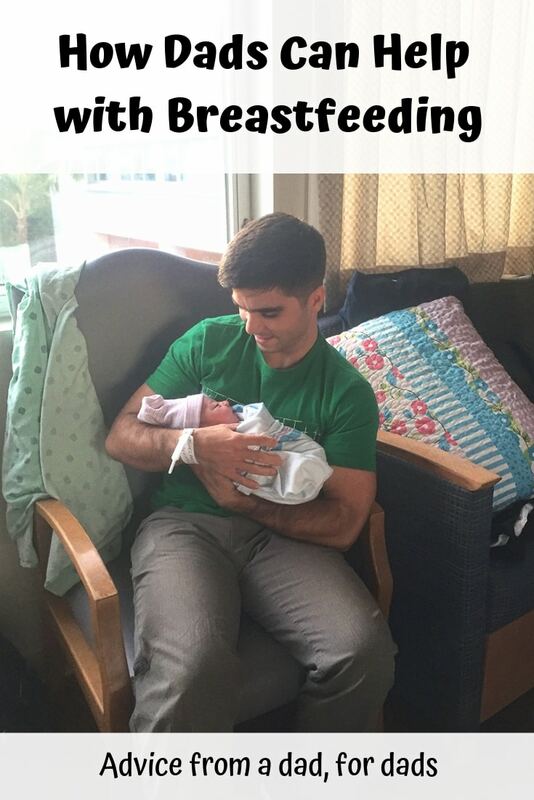 You are on your way to being a pro at being a new dad. Breastfeeding moms are incredibly hungry. Your baby needs plenty of milk which means mom needs nutrient-rich, filling food. Many women are eager to try to lose the ‘baby weight’ as quickly as possible, but trying to diet too soon can put her milk supply at risk. Tell her she’s amazing (because she is) and that her body is incredible (it just made and birthed a human!) Make sure she’s eating enough during those early weeks. It’s super tempting to reach for chips or cookies, especially in the middle of the night. Try to keep “real” foods on hand that will provide the nutrients she needs. Skip the junk food, whenever possible, and opt for more wholesome snacks like unsalted nuts, low sugar granola bars, string cheese, and lactation bites. Consider making freezer meals before Baby arrives or make extras one night so you can have leftovers the next. You can also ask friends, family, and coworkers to arrange a meal train to keep real meals available during the early days. Whether or not to cover up while breastfeeding away from home (or even at home if there’s company over) is a contentious topic. Your partner may not want to expose herself to the world and might elect to cover herself. She may also advocate for the baby and feel that eating under a blanket is like adults eating with a paper bag over our faces. Your baby may not even tolerate nursing under a cover, regardless of what Mom intends! I encourage you to support your partner, whatever her decision is. Remember that breasts are literally for nursing babies. It is only our society that sexualizes them. If you partner or baby doesn’t like using a cover, support the choice and don’t upset your partner by badgering her to do otherwise. If she wants to use a cover, don’t criticize that choice, either. She needs your love and support. Research indicates that a supportive partner greatly increases a new mother’s likelihood of breastfeeding successfully. Your support is incredibly important! I hope these tips for how to involve Dad in breastfeeding help you (and your partner!) out! Please let me know if you have an additional suggestions. If you’re worried about bonding with your breastfed baby, don’t be. There are many ways to bond with your breastfed baby. My daughter and I have a strong bond and my only milk feeding attempt involved her screaming and not drinking milk from a bottle until my wife came rushing home to help. 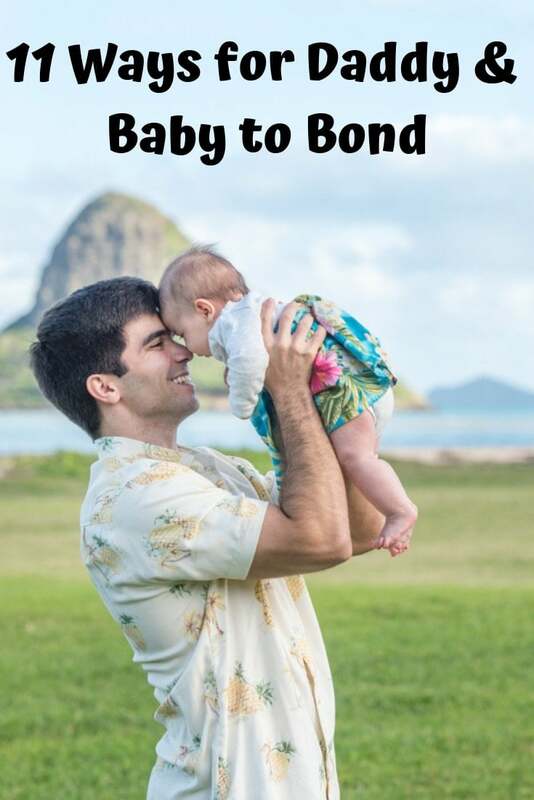 If you’re not sure how to bond with your newborn, check out these 11 ways for dads to bond with baby. I will never regret supporting my wife’s breastfeeding journey. It’s incredible that her body grew and nurtured this little human I’m privileged to call my daughter. I hope that these tips for how to help your partner breastfeed help you offer the support your family needs. Do you have thoughts on additional ways dads can offer to support to breastfeeding moms? Leave them in the comments below!